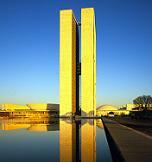 In the largely underdeveloped central west region of Brazil (called Sertao) sits Brasilia, the capital since 1960. The official name for central Brasilia is Plano Piloto, named for the winning "pilot plan" design of the city proposed by Lucio Costa. President Kubitschek moved the capital here from Rio de Janeiro to bring the countries interest further inland, away from the coast. The idea to move the capital to a more secure area was first suggested by Jose Bonifacio in 1823, and he was the one who suggested the name "Brasilia." However, Dom PedroI dissolved the assembly before any plans could be established. In 1922 the sited building area was demarcated after Dom Bosco had his famous dream that was interpreted to mean that the city should be built "between the 15th and 20th parallel." However, it was only in 1955 under President Kubitschek's command that the construction of the city took place. The entire city of Brasilia was remarkably built in only four years by the hands of hundreds of thousands of workers from all over the country. Difficulties in construction arose mainly for the reason that the land allocated to the future capital was largely inaccessible: the nearest road was over 75 miles away and the nearest airport some 115 miles. The resultant system of highways that was constructed to connect Brasilia to the rest of the country helped greatly to unify all of Brazil. Though through miserable living conditions and grueling labor, the city stood upright in 1960 and was inaugurated as the new capital. Brasilia takes the shape of a bent bow and arrow or an airplane viewed from the top, and is very rationally divided into regions and quadrants that all have their designated purposes: specific areas for resident housings, allocated areas for hotels, space for commercial areas, etc. Aesthetically, the view is quite remarkable from the top, and as a plan on paper it looks greaHowever, in terms of practicalities and necessities of a modern city, and in its lack of malleability, , that is needed for people to feel comfortable in it, it fails in a lot of ways. The Pilot Plan detailed the construction of the city to the minutest details, going so far as to include the color of the taxicabs. It allowed for no more than 500,000 residents in the city. As a result of this limit, when population skyrocketed from the thousands of workers who decided to stay in the city that they had built, surrounding Satellite Cities arose where most residents of Brasilia currently live. What marks Brasilia to be deemed a UNESCO World Heritage Site is that the city's architectural design is one of the world's best examples of a modernist city. Planned and designed by Lucio Costa and Oscar Niemeyer, it is one of the richest and most comprehensive examples of Modernist architecture. The brief description on the UNESCO website states: Brasilia, a capital created ex nihilo in the centre of the country in 1956, was a landmark in the history of town planning. Urban planner Lucio Costa and architect Oscar Niemeyer intended that every element - from the layout of the residential and administrative districts (often compared to the shape of a bird in flight) to the symmetry of the buildings themselves - should be in harmony with the city's overall design. The official buildings, in particular, are innovative and imaginative. Brasilia is a city unlike any other in the way it demonstrates the too common discrepancy found between an ideal within the mind and the resulting reality. The architecture and layout of the city is truly fascinating, and deserves a place on any architect lover's list. The city is worthy of anyone who is interested in seeing how a picture perfect plan can play out in day-to-day life, and how humanity's imagination sometimes over extends itself.